Today, I want to talk about how to balance your Army National Guard and civilian career. One of my former Battalion Commanders once told me that the “National Guard” or anything else in life, will take whatever you give it. In other words, if you devote two days per month outside of drill weekend to do your military job, you can do that. If you are willing to devote five days per month outside of drill weekend to do your military job, you can do that too. Although you won’t normally get financially compensated for your work outside of drill weekend, no one will actually try to stop you from doing the work. In fact, many military leaders will encourage you and reward you for putting in the extra hours. 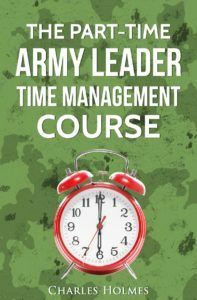 During my two years of Company Command, I often struggled with time management. I spent at least one full day each week (outside of drill weekend) ensuring my unit was squared away and prepared for upcoming training. This one full day probably equaled two work days each week. I was definitely living my life out-of-balance. As a result, my marriage suffered. So did my business and my physical health. I don’t say this to brag or boast. Actually, I’m somewhat embarrassed by my actions. I don’t want you to make the same mistakes I did. I want you to understand that you need to “balance” things in your life. Although my unit benefited from my commitment and willingness to work hard, everything else in my life suffered. Looking back, I am glad that I gave my best and made a difference in my unit, but knowing what I know now, I would have done things a little bit differently. I would have done a better job BALANCING my life, career and family. On a side note, I do understand that “command” is quite perhaps the most demanding job in the Army (for officers anyway). It requires hard work, endless hours and a lot of sacrifice. People not willing to “put in the time” shouldn’t be commanders in the first place. However, I’ve also learned that MOST military leadership jobs require similar sacrifice, albeit a little bit less time sacrifice than commanders make. Even in my current M-Day job, I probably work 15-20 hours per month, outside of drill weekend, ensuring that my military responsibilities are fulfilled. And I don’t see that commitment getting any smaller as I continue to progress through the ranks. I’m not complaining about my responsibilities. Please don’t assume that. In fact, I like responsibility. I’m one of those gung-ho guys who commits to everything I do. Thankfully, I’ve matured and learned how to step back from the situation and analyze “why am I doing what I am doing?” At this point in my career, I am more conscious about how I spend my time. I want to do a good job in my M-Day job (and I do), but I am no longer willing to sacrifice my family time, my health or my business in order to reach that goal. You need to remember to spend time with your family, do a good job at your full-time civilian employer, maintain your health, your spiritual well-being and everything else that’s important to you. You can’t ignore these aspects of your life while you pursue the next promotion. If you ignore these important areas in your life, you will eventually suffer the consequences. You might become a high-ranking officer or NCO, but your family life, your health and your personal life will suffer. For those of you that are angry with me right now; please understand that I’m not saying that it’s bad to want to be a General, Colonel or Sergeant’s Major. It’s not. It’s actually a good thing. Instead, I’m saying that if that is your goal, don’t neglect the other areas in your life while you pursue your goal. Don’t have tunnel vision and forget to spend time with your spouse and kids, stay-in-shape and maintain your spiritual well-being. Does that make sense? Veterans Win Big with a Little Known Phenomenon Called “Corporate Citizenship”… HOO-RAH! I’ve found that leaders (from every profession) often struggle with balancing their lives. After 30 or 40 years of hard work, they’ve progressed through the ranks and achieved career success. However, in many cases, that same person got divorced, never spent time with their kids, and never took care of their physical health. On the outside, they look good, but their inner-world is completely torn apart. Let me be brutally honest with you for a moment. When you are on your death bed, you won’t be thinking about the TITLE you achieved during your military career. Instead, you will be thinking about your family, your friends, your relationship with others, and you will be more concerned about what you DIDN’T DO, rather than what you did do. Just remember that before you sell out to the idea that “career success” and “climbing the ladder” is the most important thing in life. You can still achieve your career goals, without jeopardizing your health, friendships, relationships, etc. I’ve found that the most successful people maintain all areas of their life. They don’t always have the biggest title (sometimes they do). They don’t always earn the biggest pay checks. But they are balanced in all areas of their lives, and they are happy and fulfilled. Therefore, I want to give you a simple idea about how to maintain balance in your life. Each month, on the first day of the month, you need to create a balance sheet. No, I’m not talking about a financial statement. At the end of the month (on the last day of the month) spend thirty to sixty minutes reviewing your “balance sheet.” Think about what went right, what went wrong and what you need to do differently next month. Think of it as an internal AAR. If possible, involve your spouse in the process. By doing this, you will never get out-of-balance for a long period of time. You will be consciously aware about why you are doing what you are doing. And you will improve all areas of your life. In conclusion, the most effective military leaders balance their lives. They understand the importance of their family, their corporate career, their military career, their health, their personal finances and their spiritual well being. They ensure that all areas of their lives get adequate attention. As a result, they are happier, healthier, and more successful than people who don’t follow this advice. If you want to achieve success in your National Guard career, you should follow this advice too. What are your thoughts? If you’ve enjoyed my post about how to balance your Army National Guard and civilian career, please leave a comment below to let me know what you think! I look forward to hearing from you. Previous Previous post: Should You Transfer to the Army IRR? The eternal battle of the Guard/Reservist, how do you balance your personal life, civilian job and military commitments. As much as I'm committed to my military life it is definitely the lowest priority on that list. You have to keep your family intact or the rest doesn't matter. When I took my most recent position I was completely honest with my command and told them I could only commit 2 days a month and wouldn't normally be able to give more than that. They weren't happy at first, but as I told them I think honesty up front was important. Keep balance in your life or one or more of the sections of your life will suffer. Most people in the military say mission first. Yes, the mission is important. But you also have to take care of your home life. I truly believe you can put your family first and still be a great soldier or leader. In the days when I served, the Army was not nearly as “family friendly” as it is now. It is of utmost importance that you provide your family the time they deserve. I am very happy the Army has realized this and has instituted more programs that are geared towards good family relations. Balancing time is never easy. I am a firm believer in making a time balance sheet also. To be honest, since I was full Army, I never did completely understand how those in the National Guard were able to balance civilian and military duties. I commend all of you who do it on a month by month basis. I am glad you touched on the point about remembering the importance of family. Why are we doing what we are doing? It is true, on their death bed, people are not usually saying they wished they would have worked more. Nope, it’s that they would have made more memories with their family and good friends. I also think a responsibility of those in a leadership position is to keep an eye on their team and notice when things are going sideways from a work/life balance perspective and to bring it up (tactfully, of course). This is so true. Balancing your family, military and civilian career is a daunting task. It comes down to setting priorities, creating a game plan, and staying disciplined to your plan. Some jobs are more time consuming that others too, especially command. But all National Guard Officers and NCOs must learn how to do this or they will get burnt out fast.